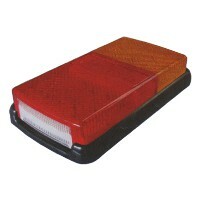 The amber section has 40 LEDs, the red section 36 LEDs and the clear section 8 LEDs. The red section also incorporates a reflex reflector. The wires enter at the rear where the circuit board is encapsulated in epoxy resin. It has a current draw of 400mA across all voltages.